OptaPlanner - How fast is logging? What’s the cost of trace/debug logging in production? What’s the performance cost of logging to a file? In these benchmarks, I compare the performance impact of logging levels (error, warn, info, debug, trace) and logging appenders (console appender, file appender) on several realistic OptaPlanner use cases. 2015-02-23 08:07:35,310 [main] INFO  Solving started: time spent (18), best score (uninitialized/0hard/0soft), environment mode (REPRODUCIBLE), random (JDK with seed 0). 2015-02-23 08:07:35,363 [main] INFO  Construction Heuristic phase (0) ended: step total (6), time spent (71), best score (0hard/-5460soft). 2015-02-23 08:07:35,641 [main] INFO  Local Search phase (1) ended: step total (1), time spent (349), best score (0hard/-5460soft). 2015-02-23 08:07:35,652 [main] INFO  Solving ended: time spent (360), best score (0hard/-5460soft), average calculate count per second (905), phase total (2), environment mode (REPRODUCIBLE). info: 4 lines per benchmark, so less than 1 line per minute. I’ll ignore the difference between error, warn and info logging: The difference is at most 4%, the runs are 100% reproducible and I didn’t otherwise use the computer during the benchmarking, so I presume the difference can be blamed on the JIT hotspot compiling or CPU luck. 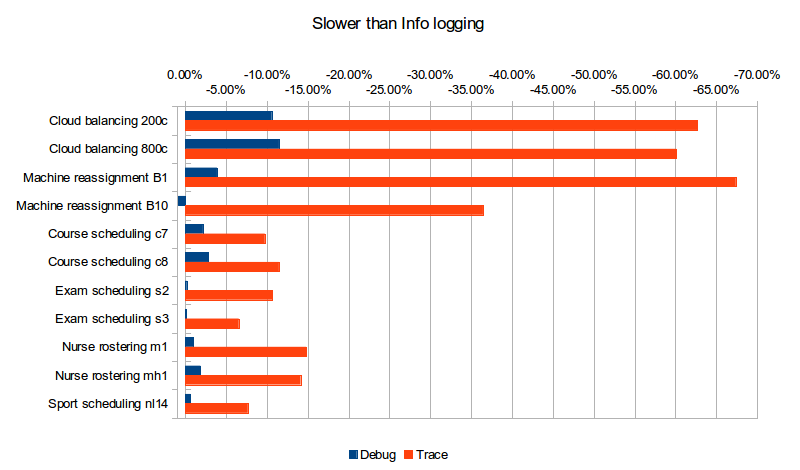 What does turning on Debug or Trace logging cost us in performance (versus Info logging)? Trace logging is up to almost 4 times slower! The impact of Debug logging is far less, but still clearly noticeable in many cases. The use cases that use Late Acceptance (Cloud balancing and Course scheduling), which therefore do more debug logging, seem to have a higher performance loss (although that might be in the eye of the beholder). But wait a second! Those benchmarks use a console appender. What if they use a file appender, like in production? What does file appender cost us in performance (versus console appender)? For info logging, it doesn’t really matter. For debug logging, there’s a noticeable slowdown for a minority of the cases. Trace logging is an extra up to almost 4 times slower! 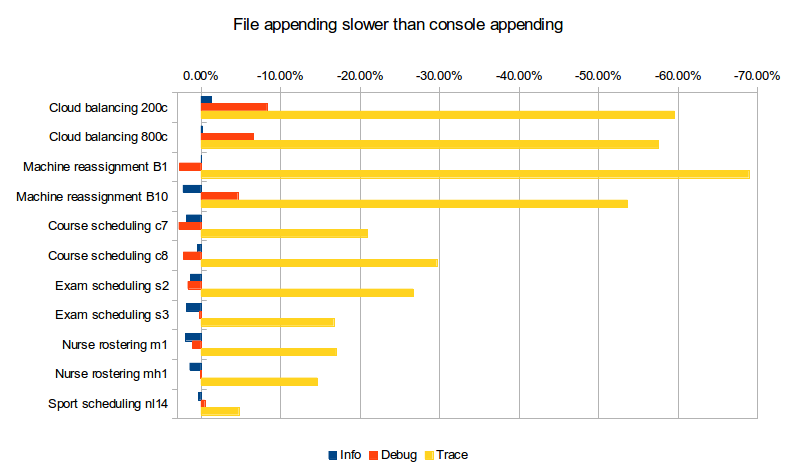 And it stacks with our previous observation: In the worst case (Machine reassignment B1), trace logging to a file is 90% slower than info logging to the console. Like all diagnostic information, logging comes at a performance cost. Good libraries carefully select the logging level of each statement to balance out diagnostic needs, verbosity and performance impact. Here’s my recommendation for OptaPlanner users: In development, use debug (or trace) logging with a console appender by default, so you can see what’s going on. In production, use warn (or info) logging with a file appender by default, so you retain important information.